French far right leader Marine Le Pen is given the comic book treatment by a Charlie Hebdo cartoonist who explores the “dark side” of the woman who could make it to make it to the second round of France’s 2017 presidential election. It attracts a young electorate, who aren't very demanding ideologically and who sometimes don't even know the National Front's history very well, they don't realise what the party's historical background really is. So the book is a way of reminding people what this party really is about, what it still represents today. The book examines her childhood as the daughter of the party’s founder, Jean-Marie Le Pen, and also explores the traumatic departure of her mother. It was co-written by Charlie Hebdo editor, Riss), journalist Saïd Mahrane and laywer Richard Malka, who wrote the dialogues. “She’s not a monster from morning to evening, but she is worrying. And if you demonise her people won’t listen to you any more, they won’t really believe you, so it doesn’t affect anyone. I think it’s preferable to show who she really is, her dark side but also sometimes her light side, because that’s more likely to convince readers,” says Malka. For years under the leadership of Jean-Marie Le Pen, the National Front represented a protest vote for many. To those outside, it was a party for xenophobes and bigots. But Le Pen’s daughter, Marine, has softened the tone, striving to make her party more mainstream. Under Marine Le Pen, the far-right National Front has risen in the polls. During the 2014 European elections, it became became France’s first political party, picking up 25% of the vote. 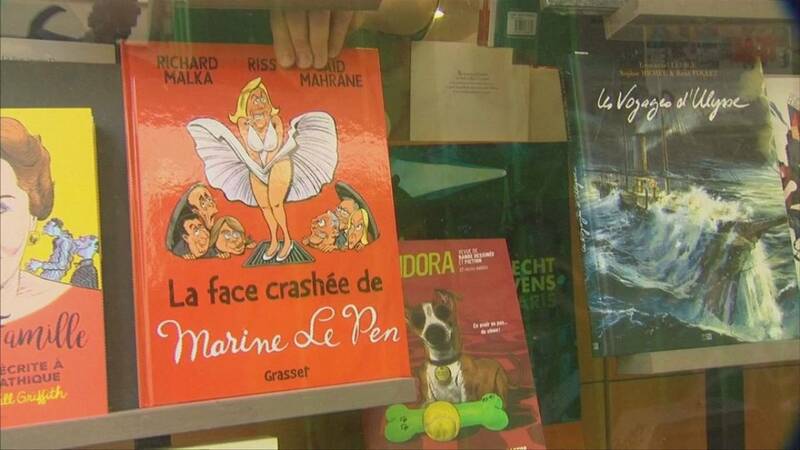 ‘La face crashée de Marine Le Pen’ (‘The Dark Side of Marine Le Pen’) by Riss, Richard Malka and Saïd Mahrane is out now.